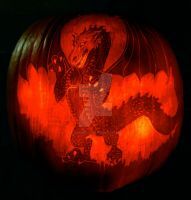 Come check out the rest of my carvings here: [link] and stay tuned for this year's as well. That is amazing, especially the translucency of it. I'm borrowing your photo to make as the background on my computer. Don't worry, I won't post it online or claim it to be mine. I'm just so impressed with it! It's beautiful! Not a problem. I'm glad you like it. Incredible work. 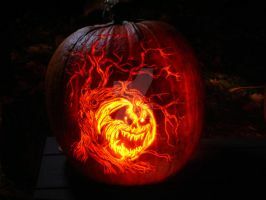 I love how it's engraved into the pumpkin like that. Thank you. Carving it like that is fun and allows for far more detail than traditional carving. question, what tools did you use to do this? I use a set of basic wood carving tools (you can get them from Wal-Mart or a craft store for cheap) and the basic tools you can get from those pumpkin carving sets. Cool. You should do something like this on New Year's Eve or something. That's an interesting idea. I'll have to try it. Oh goodie! Post pic on of it if you do! what do you use to just scrape off layers like that? I use a cheap wood carving set. You can find them in the craft section at Wal-Mart or at any craft store. Probably about 2 or 3 hours. It was made a few years ago, so I can't really remember. Yes. Well... it was. lol. It's kinda long gone now. But that's the nature of pumpkins. wow i hope you win the contest! This is really really stunning!! SON OF MAN!! 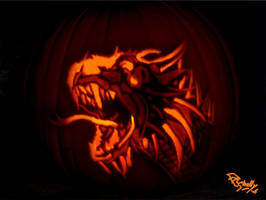 That is amazing I love pumpkin carvings and paintings This one you did is totally amazing. excellent work!! Did you cut all the way through your pumpkin? if not, then itake it you skinned it. But if you did skin it, how thin is the layer of pumpkin you left?